Be sure to check the checklist for Start, Control, Finish location. At least one headlight and at least one rear light need to be attached to the bike during inspection. A second rear light must be available (and attachable). It must be fully working during inspection. It is compulsory to have one working front light and two red tail lights in all circumstances. Riders also need to wear a reflective ankle band around each ankle. Riding brevets is a serious challenge for your body and mind. Keep a good condition before events, and warm up before start. Notify to staff members if you feel any abnormality. If you feel any uncertainty in your body while riding, stop riding immediately and take a rest or other appropriate actions. Since brevets are run on a long distance and long time period, neither standby ambulance nor pickup service can be provided. Korea Randonneurs cannot be held responsible and liable in any way for any accident, death, disability, personal injury, property damage and property theft. It is therefore strongly advised that riders take an appropriate insurance by themselves. Before the start, riders have to sign a waiver form to acknowledge the responsibility. Please check each point checklist when participating. Park your bike and first go to the check-in table. Fill in and sign the waiver form. You will receive your brevet card. You can also receive control info and overview maps (for free), if you have not printed them by yourself in advance. Check your brevet card and notify the staff if the data is incorrect or incomplete. Go to the staff member in charge of inspection of your bike and your safety outfit. You have to comply with the rules of Safety and Night Riding. Eventually you can buy a safety vest and ankle bands at the bike inspection point. After receiving a stamp on your brevet card when the safety check is OK, wait for the signal from the organizer to start. You are not allowed to start before the official starting time. Present your brevet card for receiving a stamp or signature and time of arrival. If either of these cannot be provided, please buy an item and get a receipt, which states at least the location, date and time of the purchase. Have your brevet card stamped and the riding time filled in. Sign your brevet card and leave it with the staff member. After your success is homologated by the parent organization ACP, it will be returned to you by mail (this takes normally several months). You will receive a Certificate of Achievement for this ride. If you wish, you can buy a medal at the cost of ￦15,000. Riders who finished the ride but not in the maximum time frame can still receive a certificate, but they cannot buy a medal. The brevet card will not be homologated by ACP. 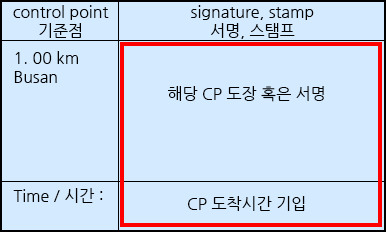 But after having checked the brevet card for the correct control stamps, the unsuccessful rider can still be listed in the results list on the Korea Randonneurs website, published soon after the day of the ride.